Posted on 25, March 2016 by EuropaWire PR Editors | This entry was posted in Energy, Gas & Oil, Norway, Transportation & Logistics and tagged INEOS Intrepid, Jim Ratcliffe, US shale gas, World’s largest multi gas carrier. Bookmark the permalink. The INEOS Intrepid, the world’s largest multi gas carrier, today arrived at Rafnes in Norway carrying 27,500m3 of ethane from US shale gas. 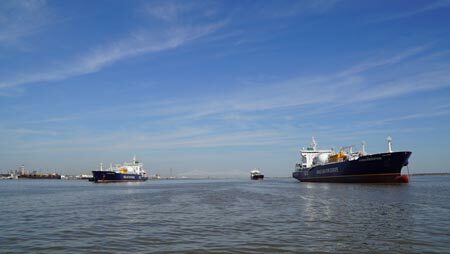 This is the first time that ethane from US shale gas has ever been shipped to Europe and represents the culmination of a $2 billion investment by INEOS. INEOS intends to eventually use eight of these huge ships to provide a virtual pipeline shipping US shale gas to its two petrochemical sites in Norway and Scotland, as US shale gas replaces the reducing gas feed from the North Sea. Rolle, Switzerland, 25-Mar-2016 — /EuropaWire/ — INEOS today confirmed that its vessel, the INEOS Intrepid, has arrived at the INEOS petrochemicals plant at Rafnes in Norway, carrying 27.500m3 of US shale gas ethane. This is the very first time that ethane from US shale gas has ever been exported from the USA and the first time it has been imported into Europe. It gives the continent the chance to benefit from US shale gas economics which did so much to revitalise manufacturing in the USA. The INEOS Intrepid is currently one of four specially designed Dragon class ships that will form part of a fleet of eight of the world’s largest ethane capable carriers. The INEOS Intrepid has “SHALE GAS FOR PROGRESS” emblazoned along its 180 metre length. The project has been complex- involving the design and long term charter of all eight Dragon class ships (which will collectively create a virtual pipeline across the Atlantic), connection of the new 300 mile Mariner East pipeline from the Marcellus shale in Western Pennsylvania to the Marcus Hook deep water terminal near Philadelphia, and the creation of new export facilities and storage tanks. INEOS has invested $2 billion bringing US shale gas to Europe. The Marcellus Shale is 300 miles from the nearest port. Ethane will be loaded onto ships at the Marcus Hook Terminal in Philadelphia. However, changing market conditions meant that the refinery shut down in 2012. A world first for INEOS!